Christopher received his initial art training at the East China Normal School before coming to the U.S. in 1990. By 1993, Mr. Zhang graduated with a master’s degree from Rhode Island College. 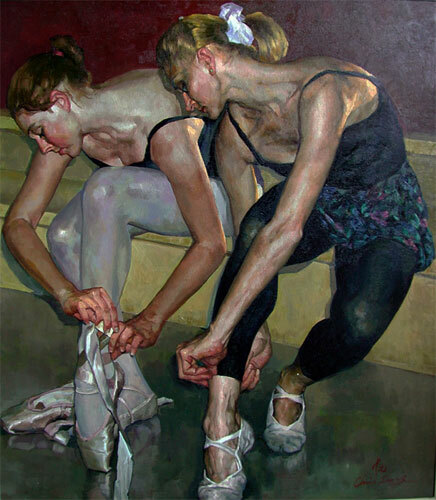 A figurative artist, Zhang combines East and West training and traditions into unique and powerful works on canvas. A May of 2001 exhibit at the MAC of his works titled “Soul of the Dancer” revealed the skills and intensity with which he works. Months of study, photographs and studio time resulted in intuitive and dramatic compositions with skillfully rendered figures of working ballet dancers. “A Personal Journey to Tibet”, exhibited in 1999 by the New London Art Society contained huge canvases of Tibet landscapes and people. For more information about the artist go to: www.chriszhangstudio.com.